On July 1st we are used to seeing big moves in the NHL, and this year it was no different. The biggest of them all was a move for a player we have been talking about all season long, John Tavares. He kept quiet until the very last moment, with many teams still in the running, before eventually announcing to the world that he had agreed on a seven-year contract with the Toronto Maple Leafs. From the minute that announcement was made, the Maple Leafs instantly became a better hockey club, and one that can challenge for a Stanley Cup immediately, and for many years to come. The NHL has changed as a league over the past few seasons and you no longer need one stacked top line to score goals, you actually need three capable of creating chances and putting the puck in the back of the net. The Toronto Maple Leafs are now a team that has that balance. Tavares and Matthews are sure to be a dynamic duo in the middle. A player who is also desperate for success in Toronto, third-line center, Nazem Kadri. Giving them one of the best third-line centers in the league, and all of a sudden, the Leafs have huge depth. 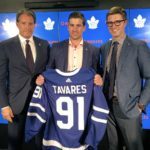 It was no surprise to see Tavares choose Toronto, despite him listening to offers from other teams over the past few days. They are his childhood team, and on their way back to the top, so it makes sense for him to want to be a part of the success that they are going to have. From the moment the Leafs decided to rebuild their franchise, things have gone very well for them, starting with drafting Auston Matthews at No. 1, a player they can build around. The Toronto Maple Leafs were quickly becoming one of the leagues most promising young teams. Adding the biggest free-agent ever certainly puts them in the championship conversation. We knew he would come with a big price tag, but that will mean nothing if he can be the difference maker when it comes to winning a Stanley Cup. The Leafs look sure to challenge for a cup over the next few years, and Tavares will play a big part in it.